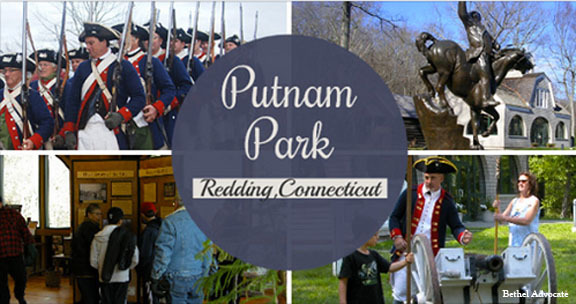 The 240th Anniversary Reenactment of the Revolutionary War Campswill take place on November 3, 2018, from 10am to 4pm, at Putnam Memorial State Park 499 Black Rock Tpke., in Redding, CT.
Putnam Memorial State Park is a state-operated historic park and public recreation area in the town of Redding, Connecticut. The state park preserves the site that Major General Israel Putnam chose as the winter encampment for his men in the winter of 1778/1779 during the American Revolutionary War. It is Connecticut’s oldest state park, created in 1887 at the instigation of Redding town residents. The park was listed on the National Register of Historic Places in 1970. In addition to its historic features, the park’s 183 acres include facilities for hiking, picnicking, pond fishing, and winter sports. The park is located at the intersection of Route 107 and Route 58 and is managed by the Connecticut Department of Energy and Environmental Protection.